Please see below the entire assembly process of the YardSaver garden sheds documented Step-by-Step on professionally recorded videos to make your assembly process even easier. The process is recorded and available below, from opening your shed box to putting on the finishing touches on your new shed. This first video is the most important as it shows you what you’ll need to ensure a stress free and seamless assembly process. 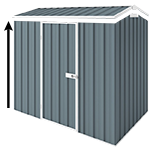 It covers all the planning and preparation required for you to assemble your shed correctly. Assembling the wall is an important part of the process. If you do it wrong your shed might fall over. Watch this short video below to ensure you put it together the right way. Just like the rear walls, the front wall is a very important part of the process. Not just because it holds the roof up but also because it contains the entry point for your shed. Make sure you get this bit right! Putting the side walls together requires a few extra steps, especially if you have a gable roof shed. Be sure to watch this video as it contains critical information which affects the whole structure. Now that you’ve got your walls assembled it’s time to join them all together. There are many important steps you must do at this point of the assembly process. If you miss one, you may end up with an unstable structure. Be sure to watch this short video below. This next video will show you the assembly process if you have a ‘Skillion’ roof shed. Make sure you watch this video to ensure you assemble the roof correctly. If your shed has a ‘Gable’ roof then make sure you watch this short assembly video. It reveals the exact steps you must take to ensure your roof is assembled safely and correctly. The doors are what will allow access to and from your shed. You really want to get this bit right otherwise you might not be able to get into the shed. Watch this short video below to see exactly how to assemble the doors. This video reveals the finishing touches your shed needs to ensure it looks great and is safe to use. It’s these little steps that make the biggest difference.